Republished March 23, 2017, 11:30 a.m. to correct the percentage of California still in D1 status. Although the drought state of emergency declared by California authorities in January 2014 is still in place, drought conditions have noticeably improved, and the northern half of the state is no longer classified in any stage of drought severity. The area of the state classified as being in exceptional drought (D4), the most extreme category, has dropped to zero, a significant improvement over the 40% and 35% of the state’s land area classified as being in exceptional drought in March 2015 and 2016, respectively. However, 8% of the state—mostly regions in the south—is still in a moderate drought (category D1) status or worse. Mandatory water restrictions, enacted for the first time in the state’s history in April 2015, remain in effect in California. State officials are expected to wait until the full winter season ends in April to amend or rescind the state’s emergency drought declaration. 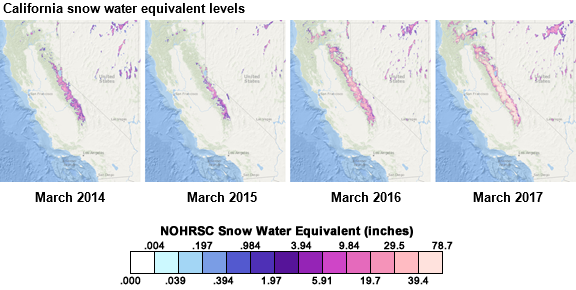 Note: California snow water equivalent data for March 2017 is based on a partial set of monthly data. 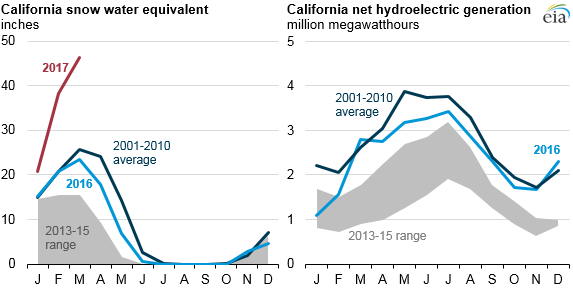 Decreasing hydroelectric generation in California in recent years has been offset by increasing natural gas, wind, and solar generation. 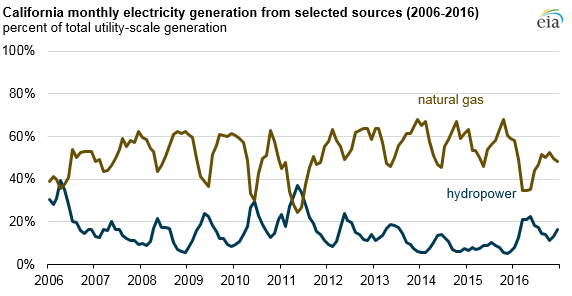 An increase in hydroelectric generation could decrease reliance on generation from other sources, particularly natural gas-fired generation, potentially helping to mitigate the ongoing limitations at the Aliso Canyon natural gas storage facility in Southern California. According to data from the California Independent System Operator (CAISO), the grid operator for much of the state, hydro generation in the CAISO service area so far in 2017 has been double that over the same period of 2016. Over the same time, natural gas generation has been down nearly 20%.